/Lelong Seller Guide /How to create a product posting? To start selling your product, you have to first create a product posting. b. Go to “My Selling“, then “Sell Item“. To sell your product, using the “Buy Now” option will be the most effective as the buyer can purchase the item immediately. STEP 3: Choose a suitable category for your item. 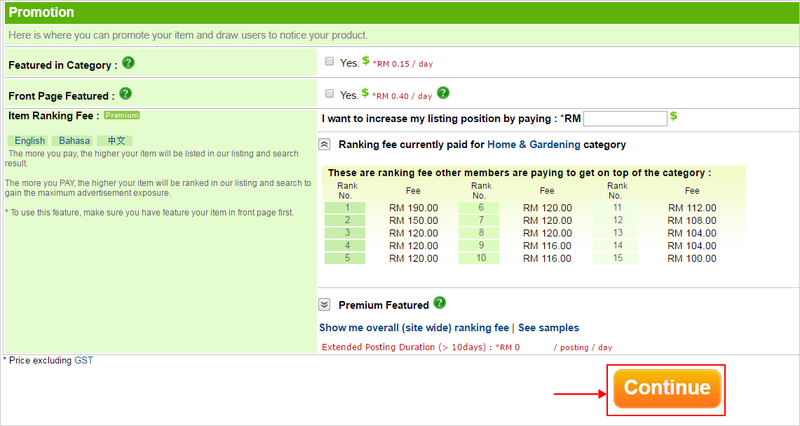 a) Choose / Search category for Lelong.my Marketplace. 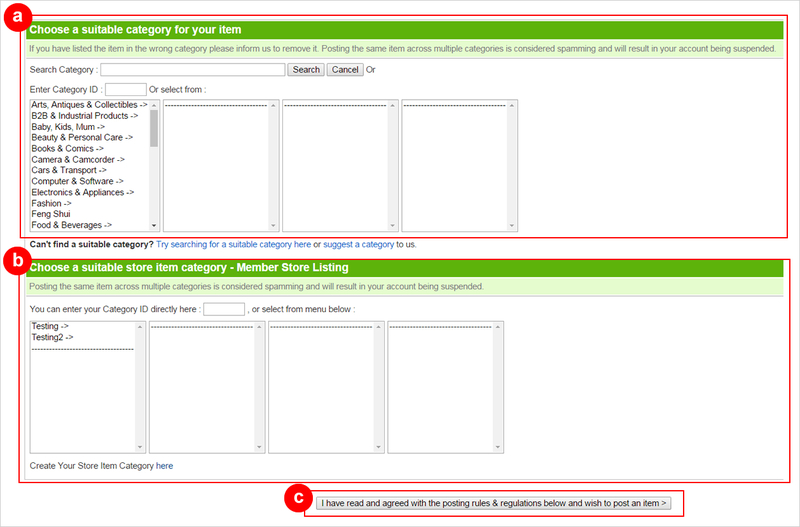 b) Choose / Search a category for your Webstore item listing. 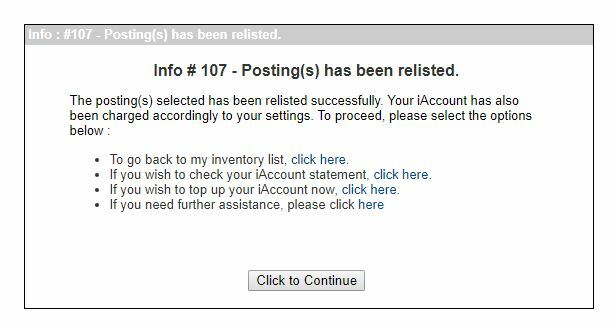 c) Click “I have read and agreed with the posting rules and regulation below and wish to post an item” button to proceed. STEP 4: Indicate product information. I. Choose “Enable Buy Now”. II. Click “Estimated Arrival Time” to select from dropdown menu – The expected timeline for the order to arrive after payment is completed. Key in the number of available stock on column. E.g: You have 10 units, key in 10 in the column. d. Start your posting – you can choose to start immediately or preschedule with the preferred date & time. e. Duration – The time period for the item to be posted in your store. (The shortest duration will be 10 days while the longest duration will be 365 days. f. Ending Time – You may end your posting by following the system time or your preferred time. STEP 5: Include Product Description . a. Author / Brand – Product’s brand or Book Author. b. Model/SKU/Code – Key in product’s model or code. If you have your own SKU, you may key in for your own reference. c. Condition – Product’s condition. d. Product’s Description – here is where you provide more details about your product. E.g: Product features, specifications, warranty and etc. 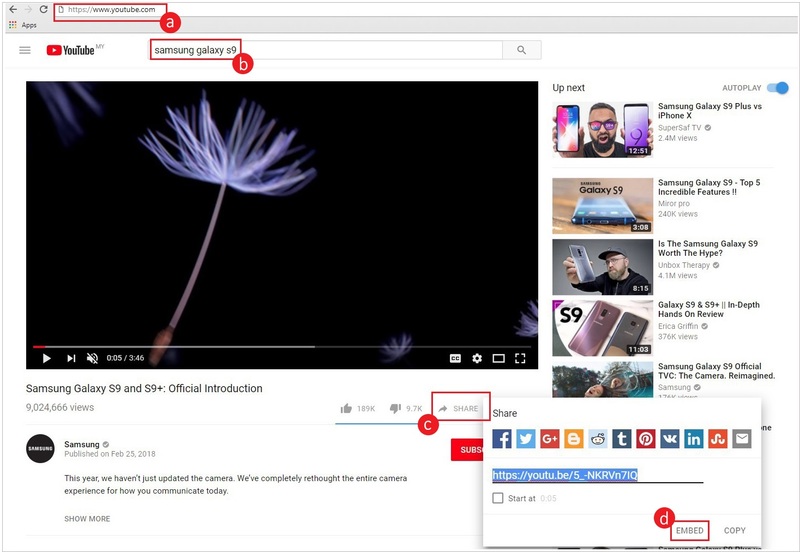 STEP 6: Embedded YouTube video into your posting. b. Search the video that you want to insert into your posting. d. Click on “Embed” button. e. Copy the codes by click on copy. f. In Lelong.my posting page, look for “Video/ Flash Content”, then click on the “Place your embed code here” then paste the copied code from Youtube into the textbox. a. Click on “Click here to upload” button. A pop-up box with “upload image” will appear. b. Click “Choose File” to open image file. c. Search your image file and choose image to upload and then click “Open”. d. Once image name appears on “upload image” box, click “Upload Now”. e. After the image is uploaded successfully, close “upload image” box. ** You may repeat steps a – e in “Upload Additional Pictures” feature. ** You may update the payment, shipping and product location information in this column. b. Delivery Method – How do you deliver the item. I. Buyer pays – Buyer is paying the shipping fees. II. Seller pays – Seller bear the shipping fees. It will appear as “FREE SHIPPING” in your live product page. d. Combine Shipment – You need to activate the plug-in before you can use this feature. e. Item Location – The location of the product. It can be your current or physical shop location. You can also choose where you want to ship the item. Select if you wish to have advertisement features for the posting. To skip this option, click “Continue” to proceed. Recommend you to select “Save to My Draft” instead of “Submit Now”. ** Save to My Draft – As backup to your posting. You still can edit the posting before it goes live. ** Submit Now – Your posting will live immediately. No backup at your end. You have successfully created your product posting. b. 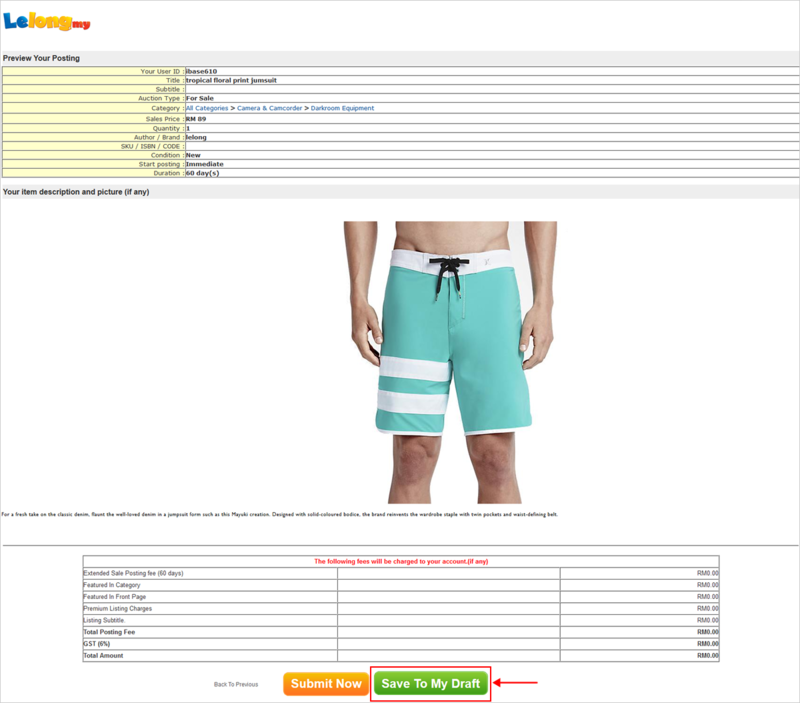 Add More Item – Click this to create another product posting. c. Back to My Draft – Check your previously saved product posting. e. Back to Home – To Lelong.my homepage. Pop-up will appear as below, click “OK” to proceed. Once posted to live, this prompt message will appear. Click “Click to Continue” to go back to My Draft Listing.